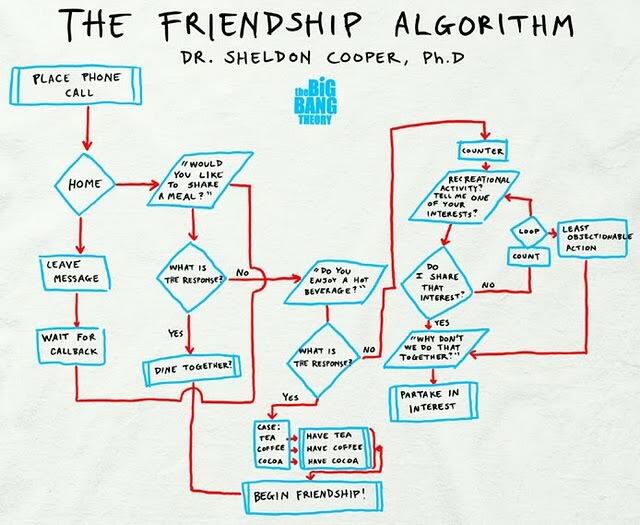 Do you have a formula for friendship? You gotta admit, Sheldon’s is pretty on point. Yes you should. It’s one of the best shows on tv. And it deals with friendship all the time. You should never seem (or be) desperate at doing anything. It shows something isn’t right and you should take a different approach. Actually, doing anything in life is easy; it’s just a matter of knowing how to approach the situation for oneself–that’s the tricky part! If there is a struggle, change your approach. The Bang Theory Was Very Creative, it Looked Like He Was planning a play Date. He Was also Concern about The interest of The Other person To ask Them What Did They Want To Do. To go That far ‘N Draw Out Activity On a Board I Don’t Believe That U Can go Wrong. A Good Suggestion, A Very Funny skit.